Motion pictures tend to vary in running time and content, from the full feature-length film to the animated short. A subsection of cinema that generally does not receive as much attention – the movie trailer – was the focus of UCLA Assistant Professor Frederick L. Greene’s October 19th talk “100 Years of Coming Attractions”. It is an often overlooked fact that trailers did not immediately emerge alongside the creation of the movie camera in 1894. For the first 18 years, print advertisements were the common outlet for informing the public of future venues; in 1903, magic lantern slides took over that role. It was not until the advent of serials that a preliminary version of the trailer was introduced. Engendered by the recurring series known as What Happened to Mary (Charles Brabin, 1912), these prototypes encouraged spectators to revisit the theater to continue the storyline. Thus, a new form of promotional material was born. The practical purpose of trailers is to convince potential customers of the value of an upcoming product; they act as samples of much larger projects, enticing viewers with a taste of what the film will be like. Greene refers to them as “synecdochal structures,” relaying significant amounts of information in a compressed form. 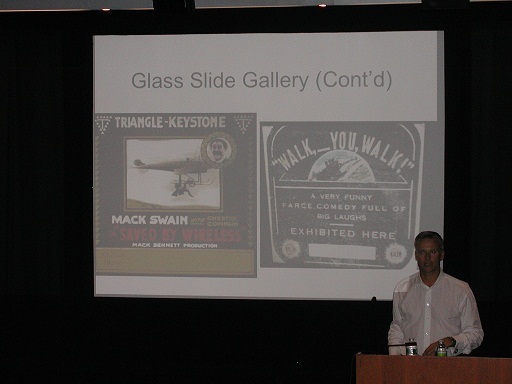 Referencing examples ranging from the silent version of Phantom of the Opera (Rupert Julian, 1925) to more modern pieces like Inception (Christopher Nolan, 2010), his presentation culminated with a detailed analysis of the humorous, meta trailer for The Pink Panther (Blake Edwards, 1963). To learn more about Professor Greene’s work, visit http://movietrailers101.wordpress.com.